Of all Donald Trump&apos;s heresies as a GOP presidential candidate, perhaps his biggest split with Republican orthodoxy has come on the issue of the debt. Trump’s economic plan — a combination of tax cuts, new spending on immigration enforcement and tariffs on foreign goods — would explode the deficit, even if Congress were to scale back somewhat the $4.4 trillion tax cut that Trump rolled out Sept. 15 at the Economic Club of New York. Trump’s new proposal is less extravagant than his first and hasn’t undergone thorough analysis yet, but in June Moody’s Analytics examined his plans factoring in the likelihood that Trump would have to compromise with Congress on $3.5 trillion in tax cuts over 10 years; that he would only deport two-thirds of the unauthorized immigrants now in the country, and that the imposition of tariffs on China and Mexico would not prompt those countries to enact retaliatory measures. In that scenario, the deficit would more than double as a share of the economy to 7.7 percent by the final year of Trump’s first term. Trump’s candidacy is making plain an open secret in Washington — that Republicans aren’t as committed to fiscal discipline as they pretend. And it’s given Democrats an opening to lay claim to fiscal responsibility, territory long dominated by the GOP. Deficit hawks say they feel homeless. Neither party is pushing to end the era of Big Government anymore. It’s also left the most committed deficit-fighters with a quandary. 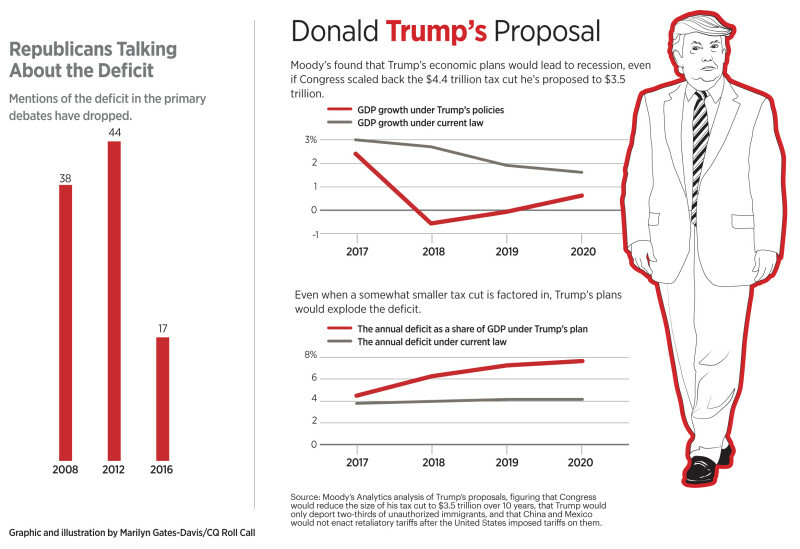 Do they go with Trump’s Democratic opponent, Hillary Clinton, because her proposals would not significantly expand the deficit, or hope that President Trump would bow to more fiscally responsible Republicans in Congress? Of Republicans in Congress who care about the deficit, most are sticking with Trump. House Speaker Paul D. Ryan of Wisconsin, the former Budget Committee chairman and author of deficit-cutting plans, has endorsed him, albeit skittishly. And other Republicans associated with the deficit fight have embraced Trump seemingly without reservation. House Budget Chairman Tom Price of Georgia, for example, helped recruit fellow committee chairs in May to endorse the mogul and has since become a valued character witness for the Trump campaign. In announcing his new tax plan, Trump said that his goal was 4 percent, and he argued that “if we reach 4 percent growth, it will reduce the deficit." But the Moody’s analysis, even after scaling back Trump’s plans, found that they would lead to a recession and more debt. Rather than propose solutions to the budgetary problems stemming from America’s aging population, Trump, says Robert Bixby, the executive director of the Concord Coalition, a nonpartisan group that promotes budget discipline, has fallen back on a number of old evasions: that Washington can solve the deficit problem by eliminating waste and fraud, that Social Security and Medicare are solvent because people are paying for them with their payroll taxes, and that tax cuts will increase economic growth so much that the budget will balance itself. “It’s an all-star list of myths, and it’s just reinforcing people’s most unrealistic thoughts about the federal budget,” says Bixby. Republicans in Congress were supposed to have dispelled those long ago, and broached the politically toxic questions about entitlements that lawmakers must address to get a handle on the debt. But they haven’t. The presidency of George W. Bush, of course, was Example A. Combine his 2001 and 2003 tax cuts, the wars in Afghanistan and Iraq and new domestic spending on education and Medicare and the result was bigger debt. The small annual surplus during Bush’s first year had turned into a deficit equivalent to 3 percent of gross domestic product in 2008 and nearly 10 percent in 2009, as the stimulus he helped to shepherd took effect. Unemployment soared and the stock market plummeted. Congressional Republicans were Bush’s willing accomplices. They controlled the House for Bush’s first six years in office, and the Senate for four of his eight. According to the recollections of Paul O’Neill in his memoir of his time as Bush’s first Treasury secretary, the president was little concerned about deficit spending. To be fair, the tea party movement that yielded the Republican House majority in 2010 was as much a reaction to Bush’s profligacy, and the accommodations made by “Republicans-in-Name- Only” as it was to President Barack Obama’s health care law, which was enacted that year. The GOP Class of 2010 soon distinguished itself as more focused on budget discipline, using the federal debt ceiling as leverage to win from Obama the 2011 Budget Control Act. But the new conservatives in the House were also unwilling to compromise to reach a deal, the so-called grand bargain, that could have addressed the long-term debt problem Social Security and Medicare pose. They refused to raise taxes, gave up the opportunity to reach a more sensible deal, and ended up with the across-the-board cuts of the sequester. Those were substantial, but Congress has proved unable to stick to the spending caps it enacted. The 2013 law that averted the fiscal cliff, the 2014 budget agreement spearheaded by Ryan and Washington Democratic Sen. Patty Murray, and the budget deal last year covering the 2016 and 2017 fiscal years all raised the caps. Congress has further sheltered defense spending, which was supposed to shoulder half the burden of the sequester, by placing money in a Defense Department war fund that is not subject to the spending caps, then looked the other way as the Pentagon has diverted some of it to cover routine costs. That’s at a time when the military’s overseas commitments are on the wane. Still, the 2011 law set discretionary spending on a downward trajectory. The Congressional Budget Office says that outlays for discretionary programs as a share of the economy are projected to decline from 6.5 percent to 5.2 percent over the next 10 years. 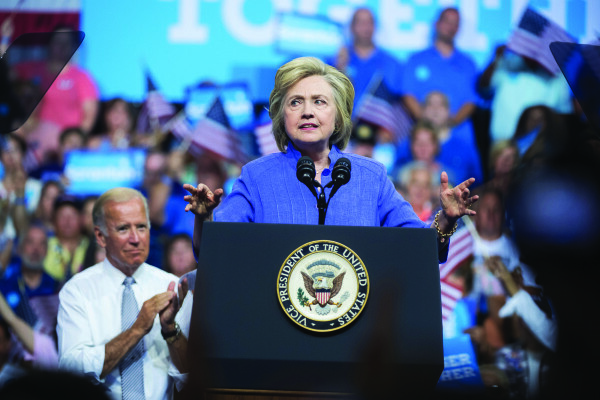 Democrats, of course, have pushed to ease the sequester’s pain and Hillary Clinton’s presidential platform is full of new goodies, including universal pre-K, free community college tuition and paid family and medical leave. She’d pay for them with a plethora of new taxes. Trump has proposed cutting the non-defense discretionary budget by a quarter over 10 years, a pipe dream. The problem that neither candidate is reckoning with is that the discretionary budget is not what’s causing the long-term fiscal imbalance. The candidates, perhaps, are acting with an eye on the voters’ concerns and the deficit is not a big one. In January, the Pew Research Center found that respondents to its poll ranked the deficit behind eight issues they think are more pressing at the moment, from the economy and terrorism to health care costs and reducing crime. During Obama’s second term, no issue has fallen further in Pew’s survey. At the start of the term in January 2013, the deficit ranked behind only “improving the jobs situation” among public concerns. One reason may be that the deficit, as a share of the economy, has declined during the Obama years, from nearly 10 percent during his first year, when Congress passed a $787 billion stimulus bill in an effort to pull the country out of a deep recession, to last year, when it was only 2.4 percent of gross domestic product, which is in step with historic norms. The deficit doomsayers may also bear a share of the blame. They’ve repeatedly bemoaned the looming disaster the deficit foretells, raised the possibility of the collapse of the dollar, a rapid rise in interest rates and the prospect that interest payments will consume an unsustainable part of the budget. None of it has happened. “The sky hasn’t fallen and it’s because we have had low interest rates for quite some time,” says Stephen Slivinski, a senior research fellow at the Center for the Study of Economic Liberty at Arizona State University. “They overplayed their hand rhetorically,” he says, and the public has tuned it out. At the same time, policymakers who bemoan the deficit during their campaigns haven’t done much to tackle the problem in office. The public has thrown up its hands. Republicans have been negligent, as Slivinski detailed in his 2006 book, “Buck Wild: How Republicans Broke the Bank and Became the Party of Big Government,” though he credits the Republican class of 2010 with trying to restore the GOP’s credibility. A Trump victory in November could mean backsliding again, Slivinski predicts. Republican presidents haven’t had a record of restraint when they have Republican majorities in Congress. The party has proved a better bulwark when it’s working against the White House. Of course, today’s congressional Republicans are a different breed than those who accommodated Bush’s plans. Some of those Republicans most reluctant to embrace Trump are part of this new class, from Texas Sen. Ted Cruz to Utah Sen.Mike Lee. The House Freedom Caucus, the conservative faction whose rabble-rousing led to the departure of SpeakerJohn A. Boehner last year, is split on the mogul. But they haven’t framed their objections, mainly, around Trump’s big government plans. Rather, they’ve mostly objected to the strongman image he’s projected and his apparent disinterest in the checks and balances prescribed in the Constitution. Other conservative opponents of big government are backing Trump on the grounds that he, at least, has unambiguously opposed government regulation and pledged to cut corporate taxes. To start, he said he’d issue a temporary moratorium on new rules and ask each federal agency to prepare a list of unnecessary rules that “do not improve public safety” or “needlessly kill jobs.” He said he will then eliminate those. If not ideal, it’s enough for many small government conservatives. “If Trump wins, we’ll have a moratorium on regulations and reform of Obamacare. We’ll move in the direction of empowering individuals and lifting government interference in the marketplace,” says John C. Goodman, a senior fellow at the Independent Institute, a conservative think tank. As far as the country’s long-term fiscal health, it’s true that Democrats haven’t distinguished themselves with honor either. Liberals have vehemently opposed the idea of reducing cost-of-living adjustments for Social Security, which could make the program solvent again in one fell swoop. They’ve politicized efforts to restrain spending on Medicare. Clinton, during her campaign, hasn’t impressed Bixby either. Like many Democrats in Congress, he points out that she’s leaned on the concept of a pay-go budget to claim that her plans are fiscally responsible while paying little attention to the long-term problems. The pay-go concept, or pay-as-you-go, was part of the 1990 budget agreement between President George Bush and Congress. It required Congress to pay for any new spending with cuts to other programs or tax increases. Since then, Congress has ignored it on occasion, most recently in 2015 when it enacted a new payment formula for doctors serving Medicare patients. 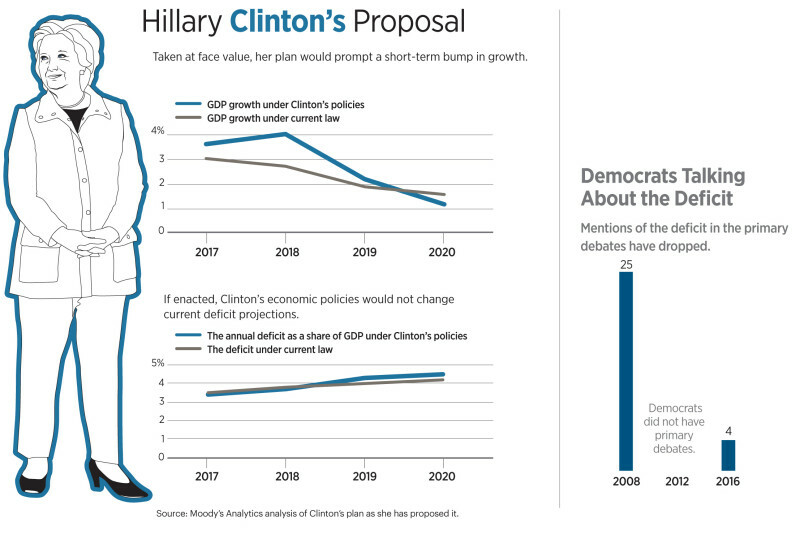 Still, no one expects Democrats to take the lead on the deficit. That’s supposed to be Republicans’ forte. And, in Trump, the country has never seen a GOP presidential candidate less attuned to it. In 2012, deficit hawks criticized GOP nominee Mitt Romney’s economic plans for their lack of specificity. But Romney alluded to his willingness to go after the problem. He pledged to control spending on Medicaid, the health care program for the poor, by turning it into a block grant and capping annual increases at 1 percent. He said he’d cut the federal workforce by 10 percent and seek to bolster the solvency of Social Security and Medicare. In 2008, the Republican candidate, Arizona Sen. John McCain, said he’d eliminate the annual deficit by 2013 and that he’d consider raising the Social Security retirement age, while reducing annual cost-of-living adjustments. The specifics were lacking, but he at least paid lip service to the issue. Even George W. Bush tried to tackle Social Security’s shortfall. He broached the third rail of politics during the 2004 campaign, a courageous move, and tried in 2005 to convince Congress to allow workers to invest a portion of their payroll taxes in private accounts. But public opinion polls showed most people didn’t like the idea and congressional Republicans balked. Trump, by contrast, has pledged to preserve Social Security as it is, and to replace the current health care system with a new one that covers everyone. He’s provided no explanation, but it sounds expensive. However, one of the ways Democrats did attempt to change some of the spending can be seen in the 2010 health care law, specifically, their cutting Medicare Advantage funding (Medicare Advantage Plans are offered by private companies and seniors opting to use them receive a fixed amount from traditional Medicare to pay for those plans). Republicans have criticized them about that ever since. Still, it seems that Trump’s appeal to GOP voters, as Cruz complained during the primaries, is more about anger and angst than about traditional conservative principles. And his success has driven a new wedge in a party that was already riven last fall between a far right faction unwilling to compromise with Democrats and another still interested in dealmaking.